The Klamath is our most popular trip as it offers 50 miles of exhilarating whitewater in a spectacular canyon. The moderate class three rapids allow for plenty of excitement while still being excellent for beginners and for people of all ages and abilities. Adventure Whitewater uses all paddle-boats on the Klamath which means every one is involved and must work as a team to maneuver down the turbulent stretches. The rapids, however, are not necessarily the highlight of trip. The National Wild and Scenic Klamath River provides a true wilderness experience and wildlife is abundant. We commonly see bears, river otter, bald eagles, osprey, deer and many other animals. When not enjoying the scenery water fights, team building games and swimming abound in the deep, calm pools between the rapids. A side hike to Ukanom Falls is a highlight of the Klamath Trip. 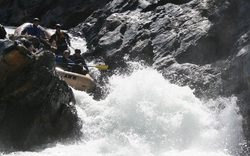 The Salmon is one of the most challenging and exciting commercially run whitewater rivers in the state of California. This spectacular incredible scenery and cutting edge whitewater provides an intense and unforgettable experience. The Salmon offers classic pool-drop rapids, clear blue-green water, in a sculpted granite gorge. The names of the Class V rapids that you will experience include; Cascade falls, Last Chance and Freight Train. The guides on your trips are literally some of the best in the world as three of them are members of the USA rafting team and several spend the off season guiding in other countries. Due to the difficult nature of these rivers we ask that only experienced and fit paddlers sign up. Participants on this trip have usually gone on other class IV rivers and are active in life-style.